Memorial Wall to Colby Women, 1875-1900. Acrylic, collage on paper; 2 dvds projected onto canvases, bricks collaged vinyl names, 8 silverpoint drawings. Installation 10 November – 31 December 2006. Maggie laying bricks for Memorial Wall to Colby Women, November 2006. Hidden Histories: Decision of the College to Separate into Men’s and Women’s Divisions; the Women Protest, 2007 Acrylic, collage, and hinges on two canvases. 72 x 48 in. Hidden Histories (open): Decision of the College to Separate into Men’s and Women’s Divisions; the Women Protest, 2007 Acrylic, collage, and hinges on two canvases. 72 x 48 in. Julia Ella Winslow 1886, signed 1890 protest pamphlet, Coeducation at Colby. 2007. Silverpoint (fugitive) on copper plate, names in braille, collaged signatures, ampersand panel. 12 x 6 in. Elizabeth (Lizzie) Mathews 1879, signed 1890 protest pamphlet, Coeducation at Colby. 2007. Silverpoint (fugitive) on copper plate, names in braille, collaged signature, ampersand panel. 12 x 6 in. Interactive portrait (closed): Janice Seitzinger (now Kassman) Dean of Students 1977-2012. 2014. Oil, charcoal, bricks, collage, wax, hinges, on 2 panels. 12 x 16 in. Interactive portrait (open): Janice Seitzinger (now Kassman), Dean of Students 1977-2012. 2014. Oil, charcoal, bricks, collage, wax, hinges, on 2 panels. 12 x 16 in. Altered books (Histories of Colby College) on brick plinth. Installation, 2007. Museum goers' writing on wall, Hidden Histories exhibition, Colby Museum. 2012. Museum goers' writing on wall, Faculty Group show, Colby Museum. 2008. 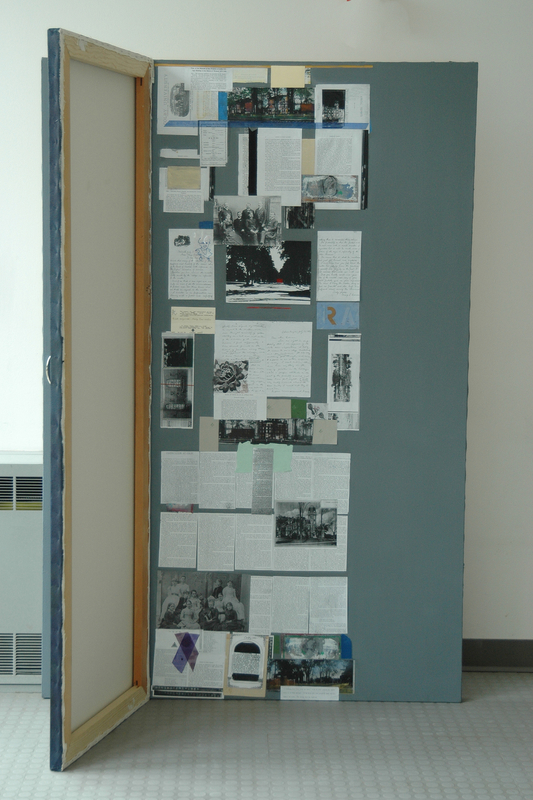 Small room installation with vitrine, Hidden Histories exhibition, Colby Museum. 2012. Large portrait wall, Hidden Histories exhibition, Colby Museum. 2012. These installations are part of Hidden Histories: a project by Maggie Libby, which recreates the history of women at Colby, especially in the nineteenth century. 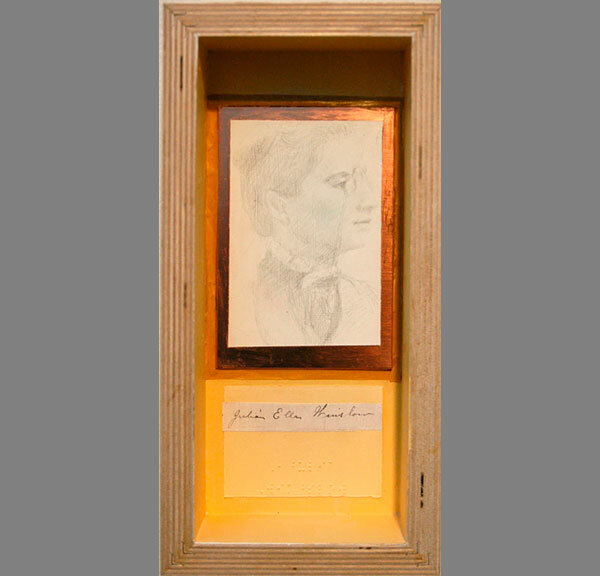 Information is compiled from the college archives, news, scrapbook fragments, and other sources for names of both the notable and forgotten women. 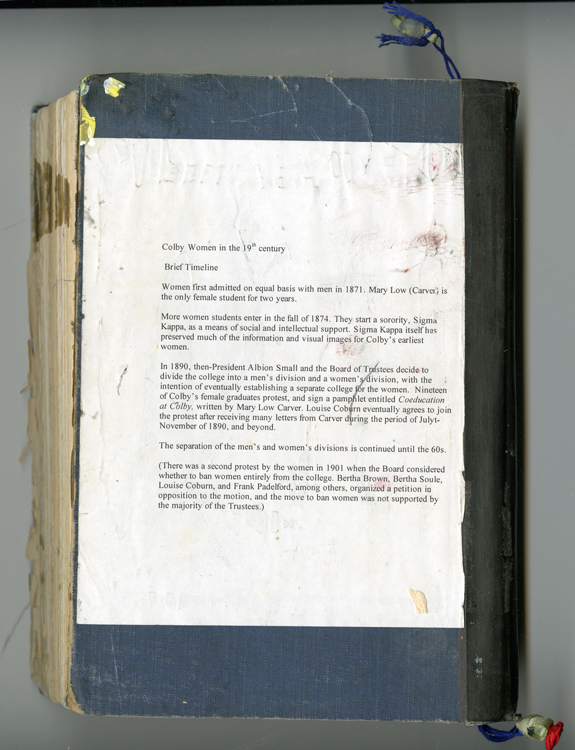 The mixed media portraits, biographical texts, altered books, storyboards, and installations document women's images, voices, and stories as an important part of the college's history. 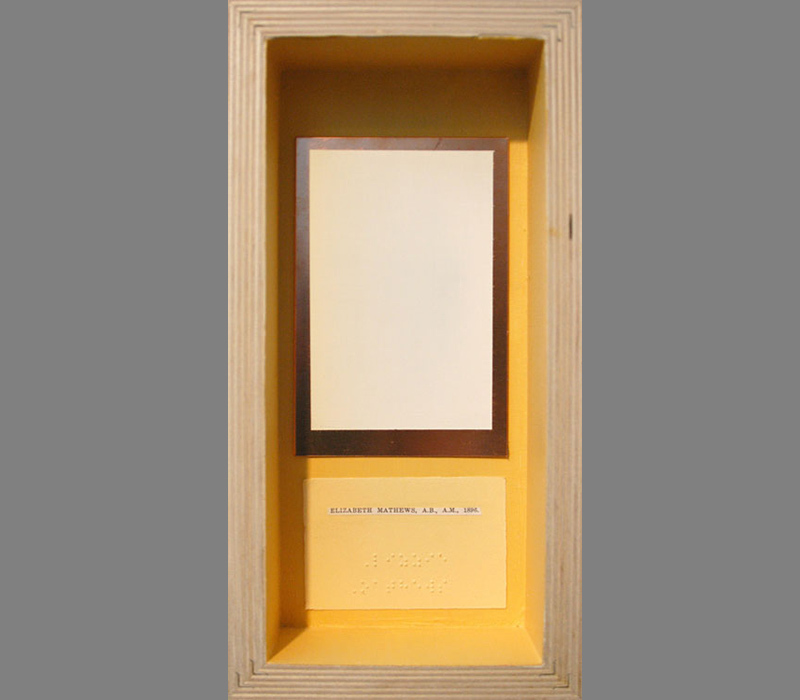 Viewers are invited to "touch history" through interactive installations of hinged canvases, altered books, printed Braille names, and the opportunity to write on museum walls. These works were shown in various faculty shows, and in a solo show at the Colby Museum of Art in 2012 during the college's Bicentennial.